Donald Trump bought Mar-a-Lago in Palm Beach, Fla., in 1985. The price of club memberships recently doubled to $200,000. President Trump and Japanese Prime Minister Shinzo Abe will be spending their weekend getting to know each other at Mar-a-Lago, in Palm Beach, Fla.
And that's really the purpose of the Trump-owned, for-profit club: to allow people to socialize at a spectacular estate built nearly a century ago by a wealthy heiress. The White House says the president will personally pick up the tab for his guest's visit, thereby avoiding a violation of the Constitution's Emoluments Clause. That clause forbids U.S. officials from taking payments from foreign governments. Still, Trump will get something from the Abe visit: global attention to his exclusive club, which has fewer than 500 members. Robin Bernstein has been a member since the Trump club opened in 1995. "It's exquisite," she says. "Everything is done to perfection, from the imported stones from Europe. I don't think Marjorie Merriweather Post spared any expense when she designed and had it built." The magnificent home was built in the 1920s to be a show-stopper. With its red-tiled roof, arched doorways and soaring tower, it's been described as a "Moorish fantasy." When Post, whose family made a fortune in the cereal business, died in 1973, she left her home to the federal government for use as a "winter White House." Several years later, the high expense of maintaining the property led the government to return it to Post's foundation, and it was put up for sale. In 1985, Donald Trump became the buyer, picking up the estate and an adjacent beach property for some $10 million. Darrell Hofheinz, who covers real estate for the island's paper, the Palm Beach Daily News, says Trump got a deal. "If you can imagine 17 acres that has been really beautifully maintained," he says. "The house itself — the estimates ranged 124 rooms — the rooms have soaring ceilings. The stonework from the exterior is amazing. Plus, it has a tower." From the tower, the view extends from the Intracoastal Waterway to the ocean, hence the name Mar-a-Lago. In Spanish, it means "sea to the lake." In 1995, Trump converted the residence into a private club with tennis courts, its own beach, a dining room and guest rooms for members. Recently, the club doubled the price of memberships to $200,000. Trump also put in a ballroom, helping make the club a prime venue for Palm Beach society. Bernstein says, "I've been to concerts there — Bocelli, Beach Boys, Kenny G, Jay leno. Throughout the years, it's just been really fun." Charities pay a hefty fee to hold their events at Mar-a-Lago. Hofheinz, of the Palm Beach Daily News, says, "I think sometimes people forget that private clubs are open to make money, and that's what President Trump opened the club to do." For groups that hold fundraisers at Mar-a-Lago, Trump's presidency has created problems. The American Red Cross had to defend its decision to hold its event last week at the club. The Dana-Farber Cancer Institute is going ahead with its fundraiser later this month but is promising to avoid "controversial venues" in the future. For Palm Beach residents, Trump's decision to make Mar-a-Lago his "winter White House" is a turning out to be a headache. Trump's visit last weekend shut down the island's main thoroughfare, paralyzing traffic and hurting businesses during the tony enclave's peak season. The town's former mayor, Jack McDonald, says locals are starting to understand what hosting a president means. "I've actually seen some comments from members of the club who are very upset about what this has become. And it's going to get worse," he says. Palm Beach officials say they're working to improve traffic when Trump is in town. And he's doing his part. He's putting in a helipad to get him from the airport to his estate without a motorcade. The White House says Prime Minister Abe will be the president's guest at Mar-a-Lago this weekend. That word guest helps avoid a possible violation of the Emoluments Clause in the Constitution, which forbids U.S. officials from taking payments from foreign governments. This hasn't been the only tricky situation around Mar-a-Lago since Trump was elected. And it's not just the president's winter home, it's a fully functioning private club with nearly 500 members. NPR's Greg Allen has this report from just outside the South Florida estate. 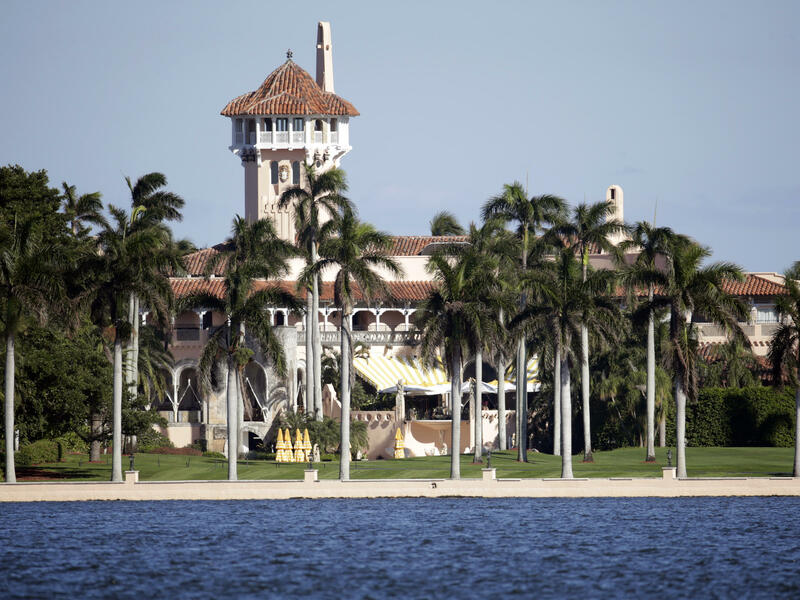 GREG ALLEN, BYLINE: This is as close as most people ever get to Mar-a-Lago. From the bridge to Palm Beach, the estate built by serial heiress Marjorie Merriweather Post is a few hundred yards over the Intracoastal Waterway. Today, it's a private club, usually open only to members like Robin Bernstein. ROBIN BERNSTEIN: It's exquisite. I mean, everything is done to perfection from the imported stones from Europe. I don't think Marjorie Merriweather Post spared any expense when she designed and had it built. ALLEN: The magnificent home was built in the 1920s as a showstopper with its red-tiled roof, arched doorways and soaring tower. It's been described as a Moorish fantasy. When she died in 1973, Post left her home to the federal government for use as a winter White House. Several years later, the high expense of maintaining the property led the government to return it to Post's foundation, and it was put up for sale. In 1985, Donald Trump became the buyer, picking up the estate and an adjacent beach property for some $10 million. Darryl Huffines, who covers real estate for the island's paper, the Palm Beach Daily News, says Trump got a deal. DARRELL HOFHEINZ: If you can imagine 17 acres that has been really beautifully maintained, the house itself - the estimates ranged 124 rooms. The rooms have soaring ceilings. The stonework from the exterior's amazing, plus it has a tower. ALLEN: In 1995, Trump converted the residence into a private club with tennis courts, its own beach, a dining room and guest rooms for members. Recently, the club doubled the price of memberships to $200,000. Trump also put in a ballroom, helping make the club a prime venue for Palm Beach society. Bernstein has been to many charity events there. BERNSTEIN: I've been to concerts there - Bocelli, Beach Boys, Kenny G, Jay Leno. Throughout the years it's just been really fun. ALLEN: Trump's organization earns income from all those events. Hofheinz of the Palm Beach Daily News says the charities pay a hefty fee to hold their events at Mar-a-Lago. HOFHEINZ: I think sometimes people forget that private clubs are open to make money, and that's what President Trump opened the club to do. ALLEN: For groups that hold fundraisers at Mar-a-Lago, Trump's presidency has created problems. The American Red Cross had to defend its decision to hold its event last week at the club. The Dana-Farber Cancer Institute is going ahead with its fundraiser later this month, but it's promising to avoid controversial venues in the future. For Palm Beach residents, Trump's decision to make Mar-a-Lago his winter White House is turning out to be a headache. Trump's visit last weekend shut down the island's main thoroughfare, paralyzing traffic and hurting businesses during the tony enclave's peak season. The town's former mayor, Jack McDonald, says locals are starting to understand what hosting a president means. JACK MCDONALD: I've actually seen some comments from members of the club who are very upset about what this has come, and it's going to get worse. ALLEN: Palm Beach officials say they're working to improve traffic when Trump is in town. And he's doing his part. He's putting in a helipad to get him from the airport to his estate without a motorcade. Greg Allen, NPR News, Palm Beach. Transcript provided by NPR, Copyright NPR.